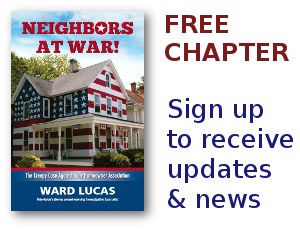 HOA Is Easier Target - Neighbors at War! I have a few questions for him. He’s claiming he stole the money because of his ill children. Did he not have health insurance for him and his family through his county job? If so, how did he end up needing $45,000 to pay medical bills? Why didn’t he put that money on a credit card? Or take a second mortgage on his house? Or set up a GoFundMe account? And why didn’t he steal from the taxpayers instead of his neighbors? Here’s my opinion of why he chose the HOA for his piggy bank. I’m one who believes if a person will steal one thing they will steal anything. In this case, I don’t think he thought he’d ever get caught stealing from the HOA. As a county auditor, he knew if he stole from the county funds his risks for getting caught and going to jail were much greater. So, he opted to steal where his could play the “my kids were sick” card on his neighbors so as to pull their sympathetic heartstrings and appease them with an “I’m sorry” and walk away with a promise to repay the HOA. Repay when, Mr. Bonillas? In this lifetime or your next? We all know HOAs rarely recover anything when a thief steals the cash. It’s always chalked up to the “we should have known better” or “it was our fault” for not having two signatures required on the checks. In this case, he was not only stealing the money he was forging the signature. I just wonder if the $45,000 was the total he stole or if there’s more to the story? Bottom line: Joshua Bonillas should be going to jail. April 11th he will be sentenced but his neighbors are already willing to forgive and forget what happened. What about the homeowners who can’t afford their medical treatment because they are paying HOA dues? Or cannot afford the orthodontics for their children because they are paying dues for some thief to steal? Or the maintenance that was not done thus depreciating their property values? What about all of those real life situations? Will those be taken into consideration at the sentencing? I doubt it. People make a conscious effort to forge signatures and steal money. No matter what their excuse for doing so, it doesn’t happen accidentally or unintentionally. Homeowners need to stop accepting these lame apologies and push for the highest level of punishment by law. Only when thieves know they will be given significant time behind bars will this HOA theft insanity stop! Most of our readers recall my HOA has $10,000,000 unaccounted for. The guy who ran the HOA like it was his own business for twenty years dropped dead shortly after I hired an attorney. You should have heard the neighbors telling me how he was such a nice guy to have “volunteered” to be the president for all those years. And how he was so good at the job and just took care of every little thing. (Nobody noticed the houses were rotting to the ground and hundreds of thousands of dollars in bills were not paid in addition to the ten million dollars going missing.) Nobody cared that he had just purchased two places in Carlsbad, California and was running for the BOD of that HOA. Did I ever share with you that his successor had the American flag lowered to half-staff the day he died? Yes, she did. I’m convinced she thought as the new HOA president she had been given the power of authority that the Governor and President of the United States have! All that respect, concern, and sympathy for him. But let a homeowner not pay three months of dues, watch what happens then. No sympathy regardless of their reason for not paying. They will call out the CAI attorney, charge 18% interest, add on the legal fees, and go absolutely nuts to destroy that homeowner! I do not understand the logic that seems to prevail in the minds of HOA homeowners. A simple apology from a thief seems to suffice. A few late payments from a homeowner sends them off the deep end. Could somebody please explain this to me? I just do not get it.